Why are Ankle Injuries so Common after a Bicycle or Motorcycle Accident? The anklebones are made up of three main bones that form a union between the foot and the shin. These include the following: 1) the tibia is the largest bone in the lower part of the leg; 2) the fibula is the smaller of the two bones running along the shin and runs parallel to the tibia; and 3) the far ends of the tibia and fibula form the malleolus which connects to the top portion of the foot (the talus). These bones are all connected by three groups of ligaments that connect bone to bone and assist in the movement of the joints in and around the ankle. When there is a fracture of the tibia, fibula or talus or a tear of any of these joints, this can affect the mobility and function of the ankle and restrict the movement of the foot which can in turn inhibit simple tasks like standing or walking without the use of crutches or some other assistive device. Ankle injuries can come in the form of fractures, ligament tears, or a combination of the two and are attributable to one main factor, namely, stress or traumatic impact to the joint. This happens when the joint is either extremely flexed or extended and/or from severe force being applied to the joints or bones. When only the ligaments give way to this trauma, you have a sprain or strain. When the bones give way, you have a fracture. When there is a combination of the two (as happens in many impacts related to bike and motorcycle crashes), this usually results in severe swelling of the leg, ankle and foot, pain coming directly from the site of fracture and from the surrounding area, black and blue bruising in or around the joint, and, in the most severe cases, the bone sticking out of the skin (so called “compound fractures”). According to national accident statistics and data, approximately 87 percent of bicycle and motorcycle accident victims suffer injuries to their lower extremities including their legs, ankles and feet and lower extremity injuries were the most common injuries treated at trauma centers in the U.S. following a motorcycle collision. 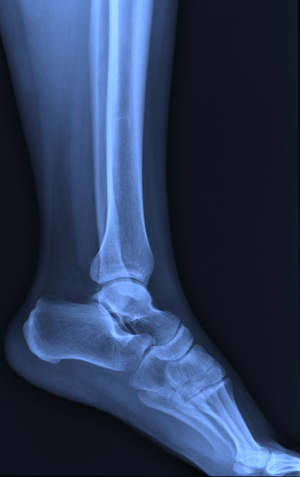 Tibia and fibula malleolar fractures were the most common of these injuries comprising 90 percent of all ankle injuries. (See U.S. Department of Transportation – National Highway Traffic Safety Administration Study: “Lower Extremity Injuries in Motorcycle Crashes” at p. 9). One of the main reasons for this is that, unlike a driver or passenger in a motor vehicle such as a car, the bicyclist or motorcycle rider’s extremities are not protected by a steel cage. In side impact collisions, the direct force of the vehicle strike can sometimes be on the lower leg itself or on the ankle or can cause the ankle to flex or extend in such a way as to tear ligaments or break bones. The other factor in play is the ejectment of the bicyclists or motorcycle rider from their bike which can cause an impact between the bones and ligaments of the ankle and the pavement or other roadway surface. Ankle injuries can also occur when the bike is “laid down” on its side which can come from both direct impact collisions and “near misses” which cause the biker to swerve and lose control. Why is it Important to Seek Prompt Medical Examination and Treatment and Legal Assistance Following An Ankle Injury from A Bike Or Motorcycle Crash? Because the anatomy of the tibia, fibula, talus and malleolus and the surrounding joints and ligaments is so complex, fractures, tears or combinations of the two can be somewhat difficult to diagnose and sometimes slow to heal properly. The ankle is the main weight bearing joint for your entire body. You rely upon it to be able to stand, walk, run, jump, and perform the basic tasks required for many jobs and occupations, home chores, and simple day to day living. This makes it imperative to seek quality consultation with an orthopedic specialist following a bike ankle injury which will include x-rays at a minimum and may and often should include more comprehensive diagnostic studies like an MRI. It is important to fully ascertain the injury and the extent it will affect future mobility and the cost of present and future medical treatment for this type of severe injury. It is equally important to hire a qualified personal injury attorney familiar with bike and motorcycle ankle injury claims to obtain the best medical evidence of the present and future costs of treatment and obtain compensation accordingly. Otherwise, you may be left with lifetime physical consequences like arthritis and other conditions that are not accounted for and not fully compensated. If you are a West Virginian, or your injuries occurred in West Virginia, you need to know you don’t have to navigate through the insurance claims process alone. Often future medical expenses will be incurred for a foot or ankle injury, and our foot and ankle injury attorneys in Morgantown would be glad to assist you to make sure you receive the full amount you are legally entitled to receive for your injuries. Call Jeff Robinette at the Robinette Legal Group, PLLC today for a Free Evaluation of your claim: 304-594-1800 or after hours 304-216-6695. Source: http://www.victimslawyer.com/ankle-injuries-from-bicycle-or-motorcycle-accidents/ July 7, 2013 By Steven Sweat, California Personal Injury Attorney. How Does the Insurance Company Decide How Much My Case is Worth?